M L Builders & Sons Ltd - Builder based in Tonbridge, Kent. 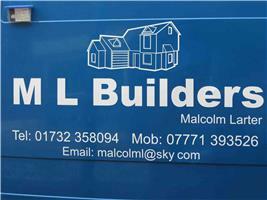 M L Builders & Sons Ltd is a family run business based in Tonbridge. All building and maintenance contracts undertaken under the personal supervision of Malcolm Larter, with over 25 years experience in building and project management. Our business his fully insured up to £5,000,000 liability and the company has a qualified and competent team. Kitchen Fitting, Bathroom Fitting, any Maintenance Work, Groundwork, Extensions, Loft Conversions, New Build Houses or Renovation. Customer care is at the heart of all our efforts. From experience we fully recognise and respect that a building project can cause a deal of concern and disruption to clients, but we plan our work with this in mind in order to minimise inconvenience.